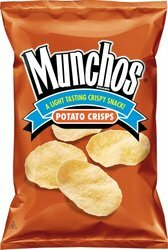 Munchos Snack Size Potato Chips. Our Munchos Chips Sales Grow every year. A great light snack, and since they are baked, they are light and crispy.